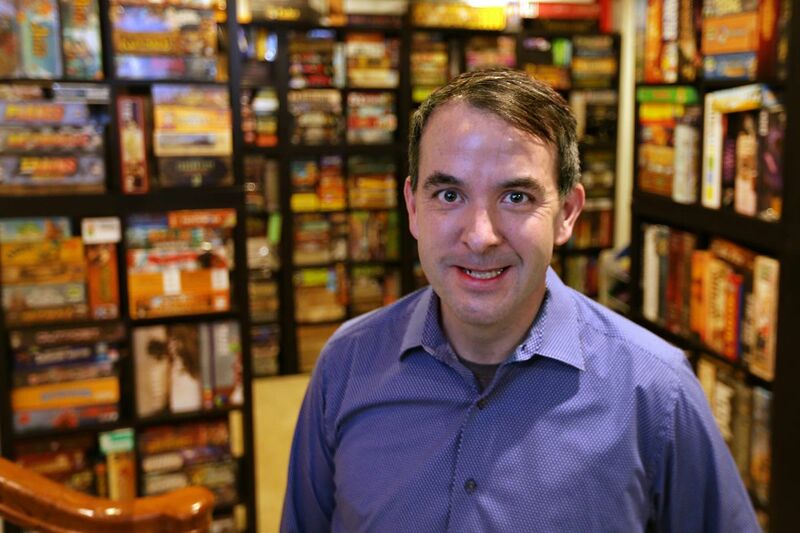 Matt Hendricks, who is opening Thirsty Dice, a board-game cafe, at home in Montgomery County with his massive collection of games. The hot genre in hospitality this year will be entertainment: clubs with ball pits, sliding boards, and ice bars. Matt Hendricks, 44, plans to roll the dice with activities — albeit much lower-key activities — at 1642 Fairmount Ave.
Late this spring, he plans to open Thirsty Dice, a board-game cafe that will give patrons access to hundreds of games, as well as a full bar and snacks from the kitchen. My background has really broadly been in management consulting, but throughout my professional career, whenever I've gotten in one of these situations where you're introducing yourself and need to tell something interesting about you, I've always referred back to board games, which I've been collecting and playing with friends — and hosting folks at our house — going back probably 25 years or more. At the beginning of last year, I had an opportunity to invest in another company, and I started doing due diligence. The more I looked at it, the more I started to think the finances weren't quite what they were cracked up to be, and I started to think, 'Well, this is how long and how much capital it's going to take for me to turn this business around and achieve the goals that we wanted to get it to.' And I thought, after I do that, in five to seven years, I'll go and open a board-game cafe. One day, I asked myself: 'Why insert this other step, because a board-game cafe just sounds like so much more fun?' My first exposure was actually with the first one in North America, which is Snakes & Lattes in Toronto. My wife and I were up there for our 10-year wedding anniversary, and I was just amazed at how they make it accessible to people. I started doing research, and I went to about a dozen different board-game cafes to get a sense of how people were implementing the model, and it just seems like it would be a great fit in Philadelphia. So right before the end of the year, I pulled the trigger on the lease, and we're off to the races. We're really trying to curate a lot of great comfort foods. It's not going to be a huge menu. There are a lot of considerations, because you don't want to have a messy plate of nachos or anything like that. We'll have a lot of the great comfort food experiences that are common to Philadelphia, and the types of things people want to have while they're playing games, and really having a great experience with their friends or family. That's the kind of stuff that we want to have on the menu — sandwiches, salads, things like mac and cheese. But I think the biggest piece of it is going to be the drinks. Certainly we're going to have lots of great craft beer, and wine, but we want to also have good coffee drinks and Bassetts milk shakes. Walk me through the experience. A big part of what you really need to do is understand that different people are looking for different types of experiences. You go to a restaurant, you want to have a selection of things to choose from. There's going to be a small retail section with some of the more popular games, but the host or hostess will explain to you that we have a curated library of somewhere in the neighborhood of 800 to 1,000 board games, and you're welcome to go over and take any of them off the shelf and just start playing. But the other thing that we're going to have are 'game tenders,' and just like a bartender, what they're going to do is be there to help you understand. Just really bringing the hospitality to playing a game. You know, making recommendations, teaching you games. When you buy a car, you don't have the dealer flop the instruction booklet on the passenger seat. They kind of walk you through the experience, and they answer questions that you have. There's a real art to really helping people understand and getting them immersed in playing a game, and really getting the fun out of it. And that's what we want to be able to do for our guests. It's some weird stuff. One of my favorites is this game called Tichu. It's basically based off of a Korean card game that's very popular in Asia called Big Two. It's a partnership, four-player card game. I've been playing that for over 20 years, and I still love it. I played it last week. It's just a tremendous game. Now, that's a little bit more esoteric. There's so much incredible innovation in games, and new things that come out. There was a game that just came out, like, last month called Azul, and you're putting these beautiful chunky plastic tiles on this board, and it kind of scratches the same itch as Candy Crush would on your phone. But it's got this beautiful, tactile component to it, and when you're sitting and playing with one or two or three other people that you enjoy having a good time with, it really takes the experience to a different level. And new games like that. There's a whole set of games that my family and a number of my friends have really enjoyed that kind of take an escape-room experience, but they localize it to a deck of cards and an app on your iPhone. Just incredible innovation. Seeing this throughout the years, and seeing what's happened with games, I think the reason I initially got involved in it was I started to look at some of the games that were coming out of Europe about 20, 25 years ago or so, and what happened in the '80s and '90s in the European game market and the American game market was very different. The American market really focused on franchises, and that's why you see so many different versions of Monopoly. The European market really focused on experiences. They tried to change the game play and the design, so that you didn't have things like somebody being knocked out of the Monopoly game an hour in, or it being pretty clear who the winner was and still having another 45 minutes of a game to go, or people having downtime while other players take their turn. And I think that introduced some really phenomenal elements. At the same time, a lot of those old classics are great, too. Just the nostalgia that it brings back to sit and play Connect 4 or Guess Who? or Clue, or something like that. … You know, those are all different types of experiences that we want to be able to support for our guests, so people are coming and looking for something they can just get up and running and be familiar with. If they're looking for some of these new classics, like Codenames or Catan or Carcassone, we're going to have those. And if they want to try to something that's more edgy and innovative, we're going to have that as well.